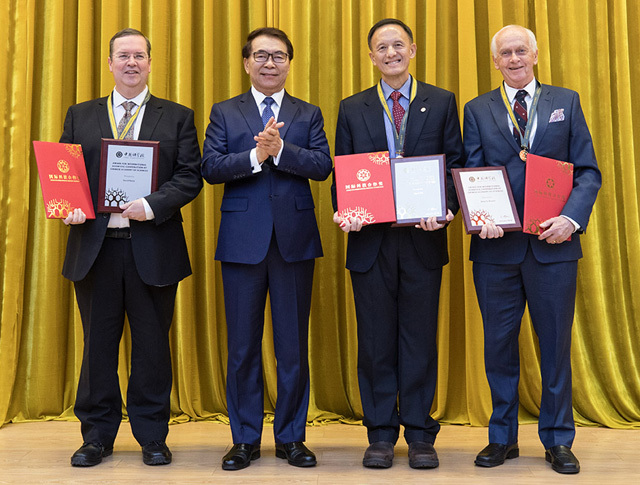 This photo shows Peter Brewer (on right) with Chinese Academy of Sciences President Bai Chunli (second to the left), along with fellow award recipients David Neely of the Rutherford Appleton Laboratory and Yimei Zhu of the Brookhaven National Laboratory. Brewer has worked closely with CAS for more than ten years, providing critical support to the design, testing, and use of the Chinese research vessel Kexue and the remotely operated vehicle Faxian. He also helped guide the academy’s five-year deep-sea research program, the Western Pacific Ocean System (WPOS), which included ground-breaking research on deep-sea hydrothermal vents, cold seeps, and seamounts in the southwest Pacific Ocean. In addition to his contributions to the cultivation of doctoral students in China, Brewer also created many opportunities for early-career CAS scientists to participate in deep-sea research cruises, helping them advance into world-class research positions. 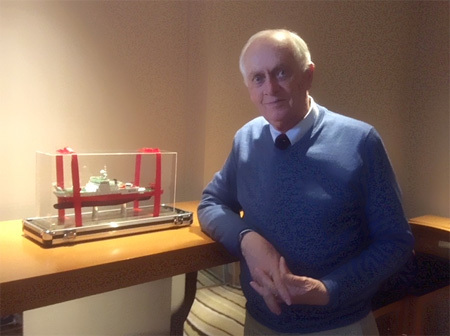 Peter Brewer stands next to a model of the Chinese research vessel Kexue. Image courtesy of Peter Brewer. Brewer noted that his achievements would not have been made possible without the help of MBARI staff members Ed Peltzer, Peter Walz, and Bill Kirkwood, as well as those of Zhang Xin, who worked at MBARI as a graduate student and is now a professor at the CAS Institute of Oceanology (IOCAS) in China. Brewer received the 2017 award from CAS President Bai Chunli during a ceremony at the new CAS university campus in China. Other recipients of the 2017 award were David Neely of the Rutherford Appleton Laboratory and Yimei Zhu of the Brookhaven National Laboratory.